Here the psalmist is reminding Israel that they are chosen by God, that they were rescued by God in the most incredible way, that God set his own mark upon His flock, by the blood of the Lamb sprinkled on their door-posts; and He led them through their enemies streets, across enemy territory, through the sea which separated before them, and on into a new land, again protecting them though they grumbled. But, as we know through scripture, the people rebelled against God…. Time after time they wanted to be their own shepherd and time after time the enemy attacked until they cried out again to the one and only Good Shepherd. Christian people are God’s chosen ones too, not replacing Israel, but grafted into that great vine of Israel, and as people living after Christ, with the whole revelation of God in His bible and the blessing of Him dwelling in us as His temples filled by His Spirit, we might do well to remember as the Psalmist reminds us that we too were rescued by God in the most incredible way. God set his own mark upon His flock, by the blood of the Lamb, and He leads us through enemy territory, and will lead us into that New Heaven and New Earth, again protecting us all the way. So Christian, today, might you find yourself grumbling, wanting to know the way, but unwilling to follow the one who loves to lead you? Might we find the enemy territory we’re wandering through just a bit hard going? Might we seek for ourselves a cross to carry that is easier and more convenient, might we look for our own paths to follow father than take the narrow path with Him? Today why not use this verse to remind you what an amazing shepherd we have, and seek His leading, His will for your life and the life of your church. Then be radical, be really radical! Obey Him, continue to listen and stay close to your Lord step by step. Sometimes we can get things wrong, can’t we? Maybe we make bad choices instead of good choices? 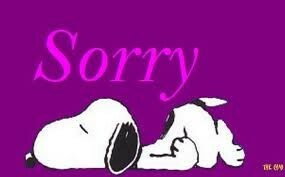 If you have something to say sorry to Jesus for today, why not have a quiet time just like Snoopy and ask Jesus to help us say sorry and make better choices next time?